Redisearch.com is the PUP that uses misleading techniques to prevent removal. Use Reimage to locate malicious components and get rid of them faster than with uninstall instructions. A full system scan blocks virus reappearance and prevents traffic to malicious domains. Redisearch.com is a fake search engine that looks incredibly similar to Yahoo, Google or Bing. This delusional appearance is designed to attract computer users into downloading the potentially unwanted program (PUP) that later hijacks user’s browser and modifies its settings. Even though it is not a malicious virus, people might face some difficulties while trying to uninstall it. Thus, a vast of computer users who are dissatisfied with its services tend to call it that way. This browser hijacker stealthily infiltrates into your system and alters default search engine, homepage, and new tab URL by assigning to hxxps://Redisearch.com. In other terms, you are forced to use its services every time you surf the web. This browser modifications allows collecting information about your browsing experience and interests continuously. Some of this data might be personally identifiable and cause privacy-related issues. Thus, we strongly recommend avoiding to submit credit card details or other valuable information in the search bar. If you do so, the developers of the potentially unwanted application can misuse it for their own purposes. Besides, various records show that the search results it provides are filled with sponsored ads. Since the developers are unknown, we believe that they won't take responsibility for the content of ads they promote. Be aware that if you click on those advertisements, they might lead you to suspicious websites that are managed by crooks to swindle money or distribute malware. Moreover, the main problem is that people face some complications when they try to uninstall the browser hijacker from their system. Potentially unwanted programs (PUPs) are designed to reassign the browser settings mentioned above to the fake search engine every time user attempts to change them. Thus, some people might get frustrated and continue to use its questionable services. To avoid that you shouldn't click on any types of ads and start a Redisearch.com removal instead. We suggest using Reimage or another reputable anti-spyware program. Another reason why this potentially unwanted program (PUP) is called a virus — it stealthily infiltrates on your computer while you install regular applications. It is bundled together with third-party programs, and if you do not unmark pre-selected installation of optional apps, you will get infected with the unreliable software. You can un-tick the box granting your permission to get the PUP only if you choose Custom or Advanced installation settings. Thus, do not rush to finish the process and avoid opting for Quick or Recommended installation. NoVirus.uk experts say that the easiest way to remove Redisearch.com is employing a professional security software. Once you download it, run a full system scan. It will carefully get rid of the infected files and maintain your computer’s security in the future. However, you can opt for manual Redisearch.com removal as well. Our security experts have prepared a detailed guide provided below. But you should strictly follow it since skipping even one step might lead to doing even more harm. Therefore, to save your time we suggest choosing an automatic elimination. You should start Redisearch.com removal from identifying any suspicious potentially unwanted programs (PUPs) and getting rid of them. They might be the reason why you are not able to change your browser settings to the previous stage. Here, look for Redisearch.com or any other recently installed suspicious programs. Wait until you see Applications folder and look for Redisearch.com or any other suspicious programs on it. Now right click on every of such entries and select Move to Trash. When in the new window, check Delete personal settings and select Reset again to complete Redisearch.com removal. 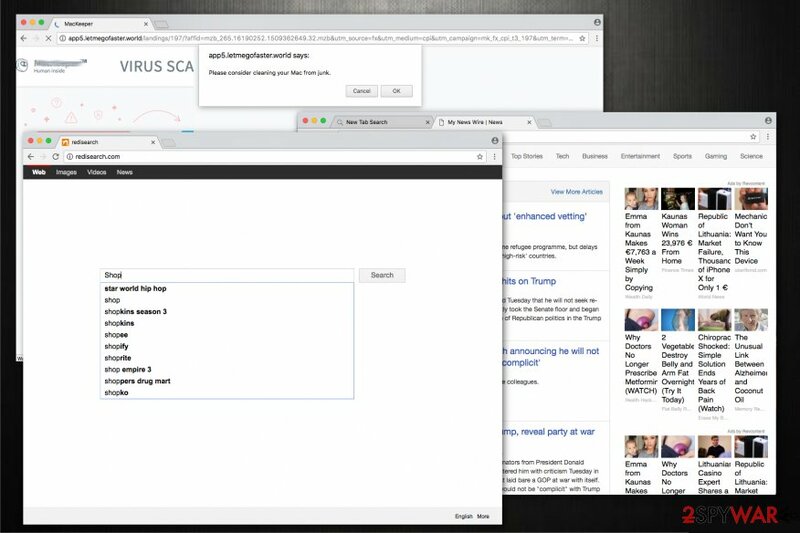 Once these steps are finished, Redisearch.com should be removed from your Microsoft Edge browser. Here, select Redisearch.com and other questionable plugins. Click Remove to delete these entries. Now you will see Reset Firefox to its default state message with Reset Firefox button. Click this button for several times and complete Redisearch.com removal. Here, select Redisearch.com and other malicious plugins and select trash icon to delete these entries. Click Reset to confirm this action and complete Redisearch.com removal. Here, select Extensions and look for Redisearch.com or other suspicious entries. Click on the Uninstall button to get rid each of them. Here, look at the Homepage field. If it was altered by Redisearch.com, remove unwanted link and enter the one that you want to use for your searches. Remember to include the "http://" before typing in the address of the page. Now you will see a detailed dialog window filled with reset options. All of those options are usually checked, but you can specify which of them you want to reset. Click the Reset button to complete Redisearch.com removal process. ^ Chris Hoffman. PUPs Explained. What is a “Potentially Unwanted Program”. How To Geek. We Explain Technology..
^ Eric Chien. Techniques of Adware and Spyware. Symantec Security Response.. This entry was posted on 2017-10-31 at 09:00 and is filed under Stealing programs, Viruses. You can quickly scan the QR code with your mobile device and have Redisearch.com virus manual removal instructions right in your pocket. How did you remove Redisearch.com virus?